It has been a point of speculation what exact model my bike was since I picked it up. First the previous owner told me that it was a 1979 Suzuki GS 450L, but then it turns out after doing some research there was no such thing as a 1979 Suzuki GS 450L, and upon close inspection the engine confirmed the fact that it was a 423cc (the actual displacement of a 1979 Suzuki GS 425). The next question was what model was the bike. 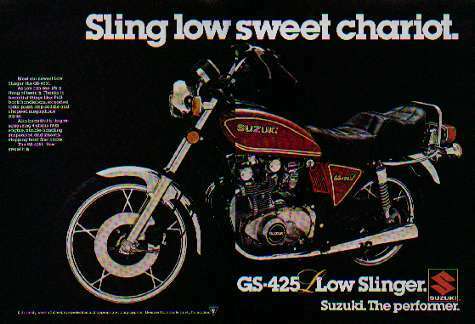 At the time to my knowledge there was a 1979 Suzuki GS 425 and a GS 425E, there was talk of there being a GS 425L being made at the end of the year but I couldn’t find too much on it. A few things prompted a sneaking suspicion that the bike was one of these GS 425L models. The “King and Queen” seat, the gauge cluster, and the latest discovery that the front rim was a 19” and the rear an 18” rim. So, after some digging I found a scan of a 1979 ad that has a bike that looks exactly like mine (save the color). So what does this mean for the project? Well the main thing is that the plan to attempt to convert this some sort of a café racer are pretty much dead in the water. The geometry of the chassis, the different sized rims embed the DNA of a wannabe chopper into the bike so much that attempting to make something sporty out would be too much to ask of the bike. There are ideas rolling around in my head but for now the plan is to not fight the nature of the bike and work towards making it a good solid runner and then go on from there. The amount of money I have invested into the bike right now is minimal and the possibility of turning around and selling it for a profit is very real. At which point I can find a more proper candidate for customization. But if the proper idea/inspiration hits me the bike could stay in my stead and it could become something more unique. Only time will tell at this point.